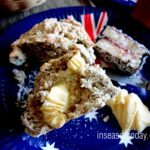 It is Australia Day tomorrow, January 26 and just like what I have been doing for the past five years, there will be iconic Aussie baked goodies like lamingtons and pavlova. 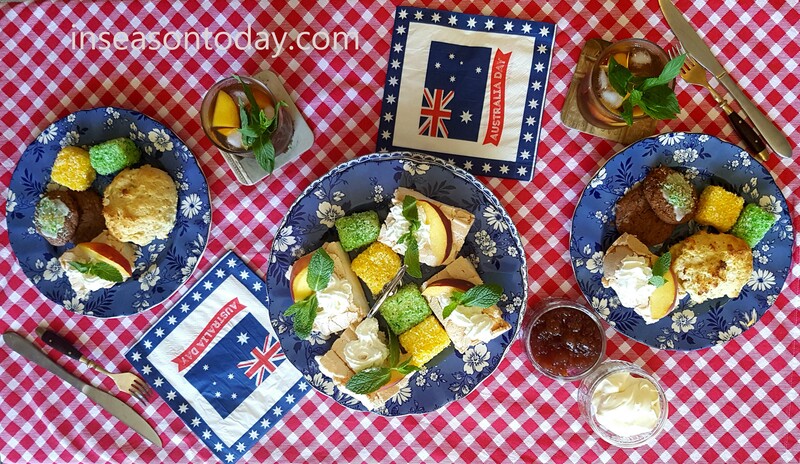 This year though, I am making an extra effort into putting together an afternoon tea of scones ( with jam and cream, of course), lamingtons, pavlova slice and Milo biscuits. Now some of you may ask, what in the world is Milo? It is chocolate and malt powder, which when mixed with hot or cold water produces a really nice beverage. I grew up drinking Milo or as a “treat” would eat spoonfuls straight off the tin. A chef friend of mine gave me a Milo biscuits recipe a few years back. 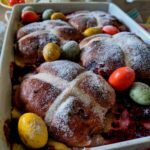 I baked a batch and posted about it on my previous blog site. One of my American followers asked, “What is Milo?” My initial reaction was, “Seriously, you didn’t know what Milo is”. Turns out, the powder was actually developed in Sydney, Australia and not a lot of my American friends are familiar with it. Milo has been marketed in most countries since its creation in 1934 and I imagine it will not be hard to find it in a supermarket aisle these days. Anyway, iced Milo biscuits will be on the platter of treats. It may sound like a lot of hard work but trust me, it is not. 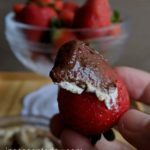 The recipes are basic and simple and I will even share a “cheat” lamington recipe to make it easier. 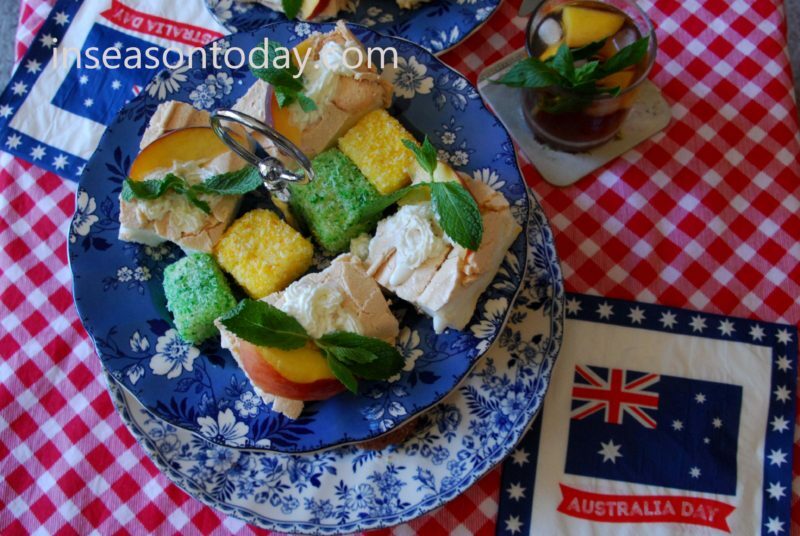 I used ready-made sponge cakes for the lamington. 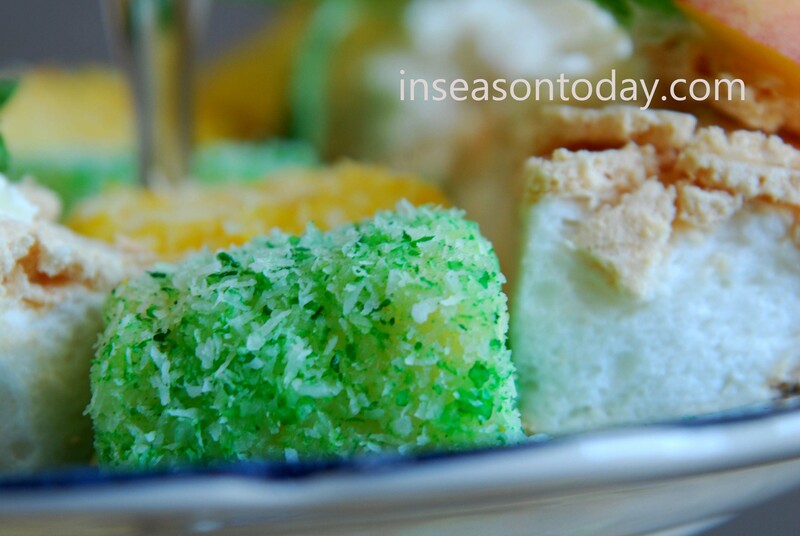 Just cut the cake into bite-size portions, dip into the icing then roll in yellow and green coloured desiccated coconut. Scones are basic flour, butter and milk recipe served with your favourite jam and clotted cream. 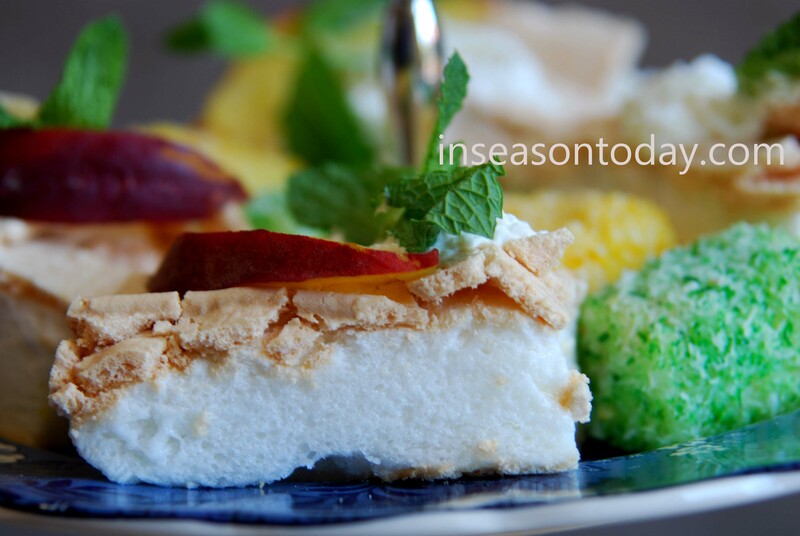 Pavlova is sugar and egg whites, whipped cream and fresh peach slices as topping. Milo biscuits are flour, sugar, egg, butter and Milo powder of course. 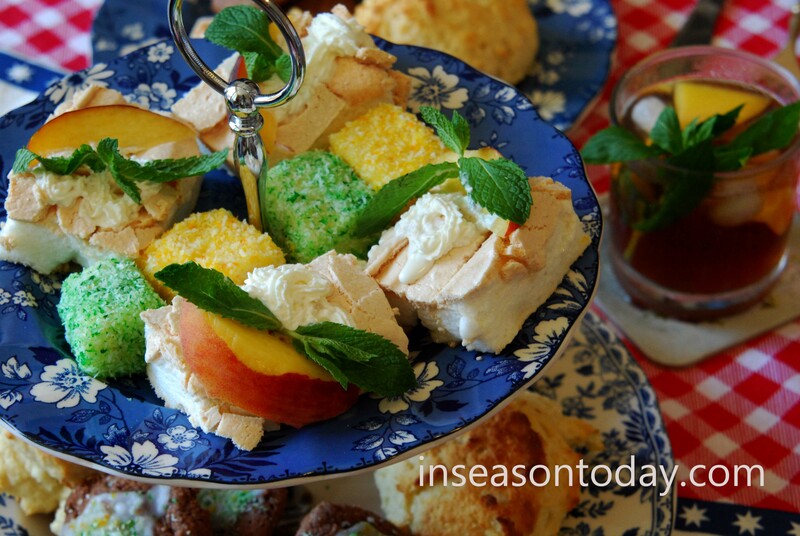 When served together, they really make a pretty platter of afternoon tea treats. And of course, it wouldn’t be proper tea time if there was no tea beverage served with those yummy baked goodies so I made a pitcher of iced peach tea. Divide the coconut between two large ziplock bags. Add a few drops of food colouring to each bag ( 1 green and 1 yellow). Rub outside of bag to mix in the colour through the coconut. Transfer to plates. 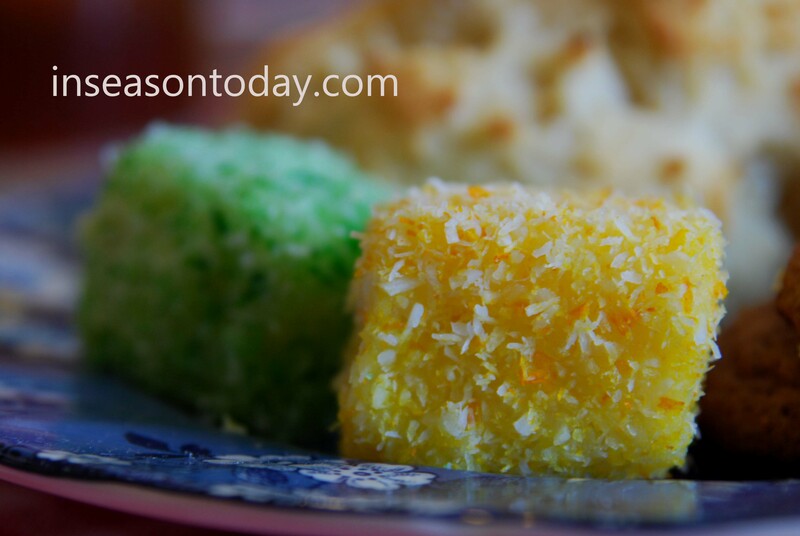 Cut the sponge cake into bite-size squares. Sift the icing sugar into a large bowl and add the hot water. Stir until smooth and quite thin in consistency. Note: These can be made a day ahead. Store lamingtons in an airtight container. Preheat oven to 150C degrees. Line a 20cm x 30cm rectangular tin with baking paper. Place egg whites in a clean and dry large mixing bowl. Beat with electric beaters until soft peaks form. Gradually add sugar, beating constantly until mixture is thick and glossy, about 5-10 minutes. Fold in vanilla and vinegar into mixture. Bake for 45 minutes or until pale and crisp. Turn oven off, cool pavlova in oven with door ajar. Lift pavlova out of tin. Spread with whipped cream. Cut into small squares. Refrigerate until required. 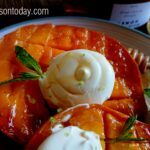 Just before serving, top each square with a peach slice. Garnish with mint sprigs. Preheat oven to hot 220C degrees. Line baking tray with paper. Place flour and sugar in medium bowl. Rub in butter using fingertips. Make well in centre of flour mixture. Add almost all of the milk. Using a knife, “cut” the milk through the flour mixture to mix to a soft, sticky dough. Add remaining milk only if needed for correct consistency. Knead dough lightly until smooth. Press dough out gently and evenly to approximate 2cm thickness. Dip 5cm cutter into flour; cut as many rounds as you can from the piece of dough. Place scones side by side, just touching onto prepared tray. Brush tops of rounds with a little bit of milk. Bake in the oven for 15 minutes or until tops are browned and scones sound hollow when tapped using fingertips. Preheat oven to 180C degrees. Line two baking trays with baking paper. Cream butter and sugar together in a medium bowl. Add the egg, Milo then the flour. Mix well until a soft dough is formed. 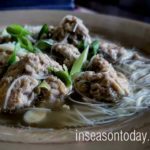 Using your hands, roll dough into tablespoon size balls. Place onto baking trays, 4cm apart. Using left-over icing from lamington recipe, spread icing on top of each baked biscuit. 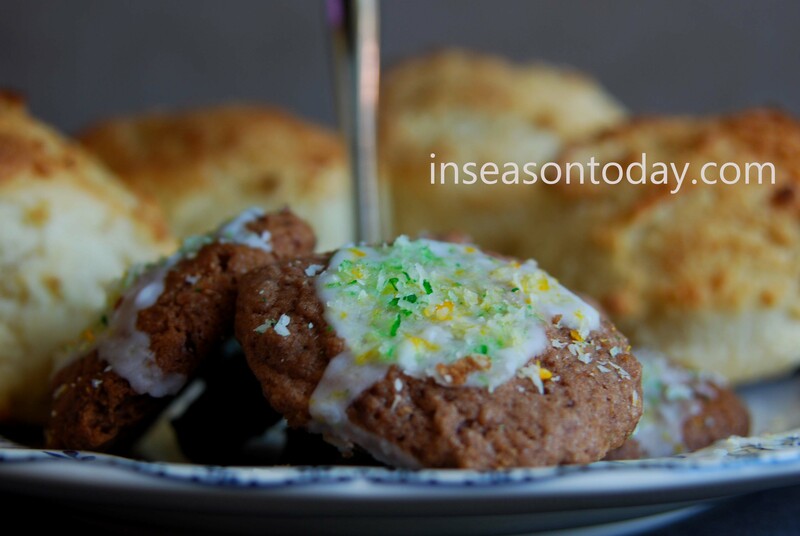 Sprinkle with yellow and green coloured desiccated coconut. For the Peach Iced Tea beverage, click here for the recipe. To all my fellow Australians, have a good and safe celebration tomorrow!